The main purpose of this book is to provide a concise overview of educational transition – to document, discuss and analyse key changes (and continuities) in South African education since the end of apartheid. What makes this period particularly fascinating for educationalists is that the legacy of apartheid and the years of international isolation meant that educational reform had to be fundamental and wide ranging if South Africa was to become a modern, democratic state participating in the global political economy of the twenty-first century. The result was that in the final five years of the twentieth century South Africa became something of a laboratory or crucible for educational innovation. From 1948 to the early 1990s South African government was based on an institutionalised system of ‘racial’ separation and inequality formally known as apartheid. A white minority dominated a black majority in a context of stark social, political and economic differentiation. While the apartheid state used force to maintain this system, formal education was also used to try to make the basic tenets of apartheid ‘normal’ and ‘acceptable’ in the minds of South Africans. From the apartheid government’s point of view, the role of education was to help to perpetuate and reproduce a racist system and to encourage obedience and conformity to that system. It is not therefore surprising that in the 1970s and 1980s education also became a key site in the struggle against apartheid or that educational reform was high on the agenda of the first democratically elected government after April 1994. However, while the direction of educational reform has inevitably been strongly influenced by the nature and history of the anti-apartheid struggle inside South Africa, the global political and economic context has also played its part in shaping educational debate and policy outside South Africa. 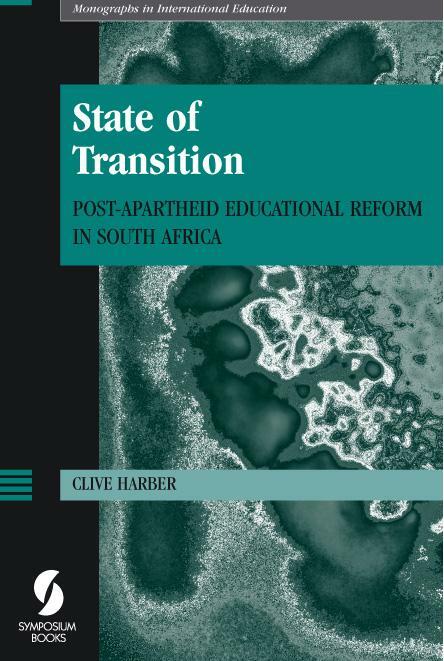 Clive Harber’s book recognises that there is a difference between planned reform and the actual nature of educational change on the ground and tries, where possible, to set reform in the contextual realities of South African education as they presently exist. It aims to understand the difficulties and ambiguities of transition as well as the overt aims and goals as enshrined in policy documents and legislation. From 1948 to the early 1990s, South African government was based on an institutionalised system of ‘racial’ separation and inequality formally known as apartheid. A white minority dominated a black majority in a context of stark social, political and economic differentiation. However, in the late 1980s and early 1990s, the institutions of apartheid began to collapse, leading rapidly to the first South African government based on democratic elections and majority rule in 1994. While the apartheid state used force to maintain this system, formal education was also used to try to make the basic tenets of apartheid ‘normal’ and ‘acceptable’ in the minds of South Africans. From the apartheid government’s point of view, the role of education was to help to perpetuate and reproduce a racist system and to encourage obedience and conformity to that system. It is not, therefore, surprising that in the 1970s and 1980s education also became a key site in the struggle against apartheid (Kallaway, 1984; Nkomo, 1990; Christie, 1991) or that educational reform was high on the agenda of the first democratically elected government after April 1994. Indeed, it was clear from the White Paper on Education and Training (Department of Education, 1995a) that the new government was aiming at a transformation of education in South Africa. However, this desired transformation will take some time and at the moment it would be more accurate to say that South Africa is in a period of rapid transition. In terms of comparative education, it has been described as a good example of a ‘transitology’ along with Hungary, Poland, Latvia, the Ukraine, Russia and Iran. This is defined as a situation where over a short time span there occurs the more or less simultaneous collapse and reconstruction of state apparatuses, economic and social stratification systems and the central value system, especially the political value system, to offer a new vision of the future (Cowen, 1999, p. 84). Much of this vision is now relatively clear in South Africa but the processes of implementing the vision remain difficult and problematic. The main purpose of this book is not to repeat the detailed historical analyses of the development and nature of apartheid education (and the resistance to it) provided in the sources cited earlier, nor to provide a discussion of the political negotiations and processes leading to independence and the first democratic elections, which are best described in Nelson Mandela’s own words in Long Walk To Freedom (1994). Rather, it is to provide a relatively concise overview of educational transition – to document, discuss and analyse key changes (and continuities) in South African education since the end of apartheid. What makes this period particularly fascinating for educationalists is that the legacy of apartheid and the years of international isolation meant that educational reform had to be fundamental and wide ranging if South Africa was to become a modern, democratic state participating in the global political economy of the twenty-first century. The result was that in the final 5 years of the twentieth century South Africa became something of a laboratory or crucible for educational innovation. The book therefore tries where possible to set reform in the contextual realities of South African education as they presently exist in order to understand the difficulties and ambiguities of transition as well as the overt aims and goals as enshrined in policy documents and legislation. I was in a fortunate position to observe and, in a small way, to participate in the major reforms that were introduced in this period of rapid change. In July 1995 I took a leave of absence from the University of Birmingham to take up a post initially as Head of the Department of Education and then as Head of the School of Education at the University of Natal, Durban. I returned to the UK at the end of March 1999. Since then, I have retained my interest in, and connection with, South Africa through regular visits concerning a research project on schools and violence in Durban. Given the widespread and multifaceted nature of educational reform in South Africa, the complexity of the South African education system, the length restrictions of the book and my own particular interests and idiosyncrasies, there are inevitably gaps in coverage. I have, for example, largely concentrated on mainstream formal primary and secondary schooling rather than, for example, higher education or on special education. However, I have endeavoured to try to capture the nature of some of the major policy changes and existing realities in relation to economic redress, curriculum and assessment, school and system management, gender and racial equity, teacher education and the conditions of teaching and learning. Finally, it is important to note that use of the terms ‘Indian’, ‘African’, ‘black’, ‘coloured’ and ‘white’ do not refer to a fixed or biological concept of ‘race’ but to the legacy of the social and political system of racial classification of apartheid that still permeates educational debate in South Africa. This being so, I have refrained from using inverted commas in relation to these terms in the text to avoid becoming repetitive.